Dean Saunders's winless run as Wolves manager extended to six games as the Championship strugglers played out a goalless draw at Derby. Chances were rare in a largely uneventful encounter that neither helped allay Wolves' relegation fears or strengthen Derby's play-off hopes. Wolves started brightly, with Jamie O'Hara causing problems. But Derby finished strongly, going closest with Jamie Ward's free-kick that was denied by keeper Carl Ikeme. Derby have not beaten Wolves in their last nine games in front of the home faithful, since a 2-0 triumph in May 1993. Wolves' position is becoming increasingly precarious and they sit just one place and one point above the relegation zone. They had the better of the opening exchanges in this encounter, though, with O'Hara particularly lively. The midfielder saw a shot tipped over by Derby keeper Adam Legzdins, before Danny Batth headed wide. Derby's first real chance of the game came midway through the half but Ward's free-kick from a promising position was too close to Ikeme. The second half was a different story however, with the home side looking the most likely to score. Will Hughes shot over the bar while Connor Sammon nodded a header just wide, but the deadlock could not be broken before the full-time whistle was blown. Derby manager Nigel Clough: "It's a fair result against a Wolves side battling to stay in the division. "We don't have too many 0-0s here at Pride Park and in lots of ways it was a good one for us. "Considering the back four we had out there, we had four centre -alves missing and a first choice left-back out so it's a brilliant clean sheet." 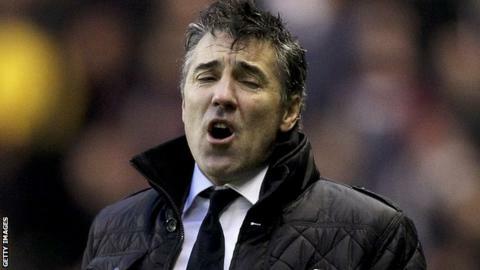 Wolves manager Dean Saunders: "I thought we should have won again. "But we didn't have that killer touch in front of goal. We made enough chances and got enough balls into the box and we were solid and defended well. "We did all the basics properly and on another day we win."